From the magestic cliffs of the Niagara Escarpment over-looking Georgian Bay to the sandy shores of Lake Huron - the Bruce Peninsula is a great place to call home. Each Municipality has it's own unique communities - all are great places to call home! Why here you ask? The Bruce Peninsula is special. Unlike the Muskokas - the Bruce has been given protection . 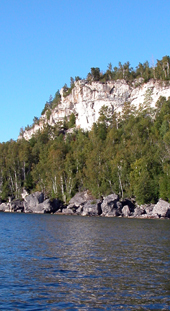 There are more than 8 provincial parks located in and around the Bruce - and 2 national parks. The Niagara Esarpement is a Unesco World Biosphere - and the ridge running along Georgian bay is protected under the Biosphere's mandates. There are lands purchased by the Federation of Ontario Naturalist's - and there are groups like the Bruce Peninsula Bird Observatory here to protect our birds & nature. People LOVE the Bruce Peninsula - and every care has been given to protect this beautiful area from harm. Can you think of a better place in Southern Ontario to call home? The Area is known for it's ubandance of nature. There are miles of unspoiled forest and pristine wetlands which supports a vast range of flora, fuana and wildlife. Here are some links to some interesting associations for the area. The area is geographically located between 2 bodies of water - Lake Huron & Georgian Bay. These bodies of water offer 2 different worlds.. and both are a fantastic way of life! Lake Huron has her sandy shores and the best sunsets in Southern Ontario. The waters are warm, and shallower near the shore. Rocky outcroppings of dolomite edge the serene harbours in the north half of the Bruce - whil white sand covers the shores in the south. Sauble beach is an example of a wonderful beach located in the area. Prestigous cottages and homes are nestled along the shorelines most with large private lots and beautiful waterfronts. Inland properties have lovely forested lots - and even some farmland. The Georgian Bay side of the peninsula offers you a rugged shoreline - with 150' limestone cliffs over-looking the turquois blue waters of Georgian Bay. This area is a natural wonder - with miles of forested trails, several national parks and of course the Bruce Peninsula National Park - this is the place to call home! Properties on Georgian Bay are still reasonably prices - let me help you find the perfect one! It is the prefect spot to raise your family or to retire - there is so much nature to offer. Both sides offer plenty of options - there are several marinas, plenty of fishing, inland lakes such as Miller Lake and BoatLake, watersports such as para-sailing and jet-skiing - you name it - you can do it on the water of the Bruce! Hope Bay - Georgian Bay - Small village located in a quaint harbour off Georgain Bay. Located just 15 minutes north of Wiarton - Hope Bay is a beautiful place where life is easy - and you are surrounded by nature. Here you can still leave the keys in your car and leave you door unlocked when you take a walk along the shoreline to view the perfect sunrises. There is a nice sandy beach in the centre of the village - which always seems to be undercrowded - so please don't spread the word! Lion's Head - Georgian Bay - Lion's Head is a port town located in the centre of the Bruce Peninsula on Georgian Bay. The town has it's own water treatment system, a hospital, medical clinic, dentist, chiroprator, school , grocery & liquor store. There is also a public areana where your children can join a the local hockey team or learn how to figure skate. Lion's Head is a wonderful place to raise a family as it has many amenities for families - including a day care. Retirees also enjoy Lion's Head as it offers a quiet retreat in nature - with the amenites of a small town. There is a thriving artist community in town - with an artist coop in the centre of the village. Lion's Head also boasts a wonderful marina. Oliphant - Lake Huron - Another small vibrant community full of history located on the shores of Lake Huron - Oliphant is a great place to call home - or a summer retreat. Spectacular sunsets, soft sandy beaches, warm friendly people are all a part of this small community. Located 13 km north of Sauble Beach and 13 km west of Wiarton- you can enjoy all the amenities of both towns yet be located in a quiet little lakeside village. Oliphant has a restaurant, a marina, nd some of the best beaches on the peninsula. Pike Bay - Lake Huron - Like Stokes Bay - this small community is located on the shores of Lake Huron. Wonderful sunsets are a common site in this sleepy town. Every summer the comminuty puts on a pig roast - and family games are run from the local campground. Red Bay - Lake Huron - This lively little village has some very nice beaches and wonderful islands to explore. The waters of Lake Huron warm up quickly here as the shoreline is shallow. Ind-surfers and sailing boats dot the waters, and families enjoy the quiet sandy beaches. Sauble Beach - Voted the number 1 freshwater beach in Canada - Sauble is a hot spot for real estate purchasing. Sauble Beach is a warm friendly community where families can enjoy the amenities of a vibrant beach comminuty. 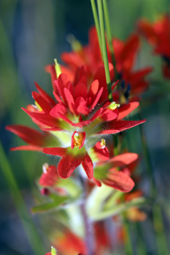 There are many local activities, and several conservation areas and parks close-by. Sauble Beach has medical services, a library, amusement parks, many restaurants, convenient stores, hardware stores, boat rentals, fishing charters - you name it and Sauble has it! 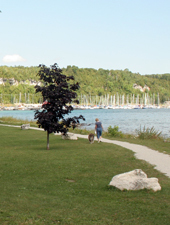 Located close by is the town of Wiarton & Port Elgin. Stokes Bay - Lake Huron - Stokes Bay is a small community with a general store, a couple of restaurants and a community centre. Many families reside here - it is a safe clean enviroment for children, and very laid back. There are local fishing derbies where children can win prises for catching the biggest... or smallest fish. Tobermory & District - Lake Huron - Georgian Bay - At the top of the peninsula you will find another port town called Tobermory. Life does not get much better for those lucky enough to have a home or cottage located near this lovely fishing village! Tobermory boasts a school, a medical clinic, grocery & liquor stores and some great small boutiques and art galleries. There is a great 9 hole golf course called Cornerstone Golf located in the town of Tobermory and an airport located on the outskirts of the town. 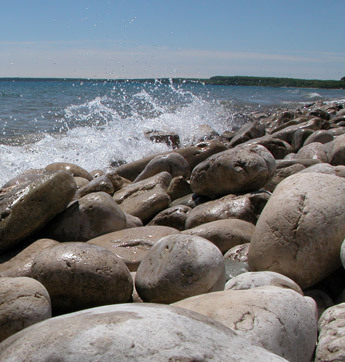 The Bruce Peninsula National Park resides here as well as the Fathom Five National Marine Park which includes Flowerpot Island and Cove Island and the famous shipwrecks. There is a new Park Visitors Centre located in Tobermory with activities available for the whole family. Regions close to Tobermory include Dyer's Bay, China Cove, Eagle Harbour, Dunks Bay and Johnson's Harbour. Wiarton - Georgian Bay - Famous for that world weather forecaster Wiarton Willie - Wiarton is a small town with some large facilities. There is a new hospital, dental clinics, a seniors home, a school, an airport, several grocery stores, clothing, shoe and a butcher shop. Wiarton also has a public arena. There is a park in town, called Bluewater Park - located on the shores of Georgian Bay. A fair size marina is also located in the town of Wiarton - with plenty of transient slips for visitors. This small town has all the conveniences of a larger town - without the hustle bustle.